But here’s a part of forklift safety that rarely is mentioned as often: forklift maintenance. Many people don’t regard maintenance as a critical part of forklift safety, but it is! According to the U.S. Occupational Safety & Health Administration (OSHA), forklift maintenance is one of the most important elements of total forklift safety. Imagine a forklift worker with the most up-to-date OSHA compliant certification (we know exactly how you can get this training). This worker always does the “right” thing behind the wheel. They never go above the recommended speed. They always use their safety signals. They always put safety first. Now, think about how safe they’d be able to drive a forklift with a flat tire, or a loose hydraulic fluid hose, or a broken backup alarm signal. All of a sudden, a safe situation becomes dangerous because of poor forklift maintenance! How does forklift maintenance improve safety, and also save money in the long run? And how can you get started with your forklift maintenance plan? OSHA’s online Powered Industrial Truck resource has plenty of great information. We recommend regular checks if you ever have any questions about your forklift safety. The safety organization’s Pre-Operation e-tool is an outstanding resource that explains how different aspects of forklift maintenance and inspection can increase safety, and also create good habits for your entire company to follow. Remember, OSHA requires daily inspections before a forklift is placed in service. This is an important part of standard 29 CFR 1910.178(q)(7). Inspections are different from maintenance, which involve testing, repair, and other forklift tasks. Our handy forklift inspection checklist can get you started on the right path! Make sure your forklift fleet has a regular maintenance schedule, and you’ll not only avoid accidents and injuries. You’ll also save money, too! Properly inflated tires, fluid changes, and other maintenance activities help forklifts perform longer. Just like your automobile runs better (and longer) with dedicated maintenance, the same thing is true with forklifts. If you want the best way to increase safety and save operating costs, it’s pretty simple: get on a regular forklift maintenance plan! Start a Forklift Maintenance Program Today! If you already have a forklift maintenance plan, or need to improve one, the OSHA forklift maintenance recommendations are a good place to start. But that’s only the beginning. After all, the OSHA website guidelines are not a one size fits all approach. Every company is different. Some forklift fleets require specialized inspections. Others need maintenance plans for propane forklifts only. Depending on your own requirements, a forklift maintenance plan can mean many different things. But the bottom line is this: OSHA requires forklift maintenance on a regular basis! A well-planned forklift maintenance program, like a thorough OSHA compliant training course, takes care of all the details. With our forklift training program, you’ll acquire the skills & knowledge you need to operate any forklift safely. Plus, you’ll also learn about the most recent OSHA compliant forklift maintenance policies. 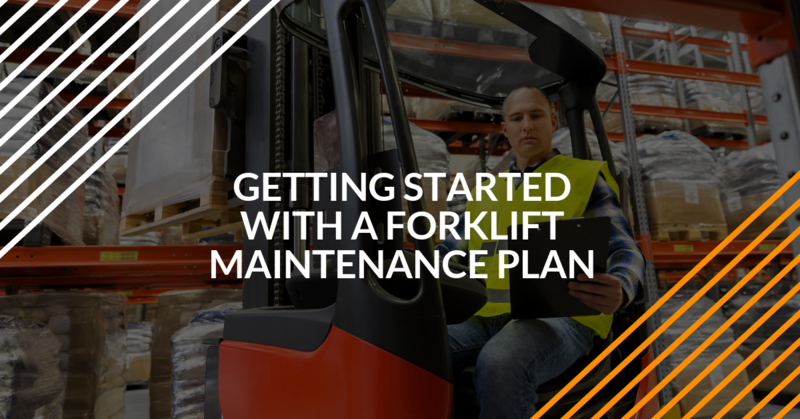 From properly inflated tires to regular fluid checks, we’ll show you how to create, implement, and maintain a forklift maintenance plan for your entire company! Check out our courses and sign up today. ForkliftCertification.com puts you in the driver’s seat (literally) with your forklift career. With our training, you’re able to get a better job just about anywhere in the country. And for employers, ForkliftCertification.com helps any employee obtain OSHA compliance in less time than you think! If you have any questions about our forklift training program or forklift maintenance in general, give us a call at (888) 278-8896.